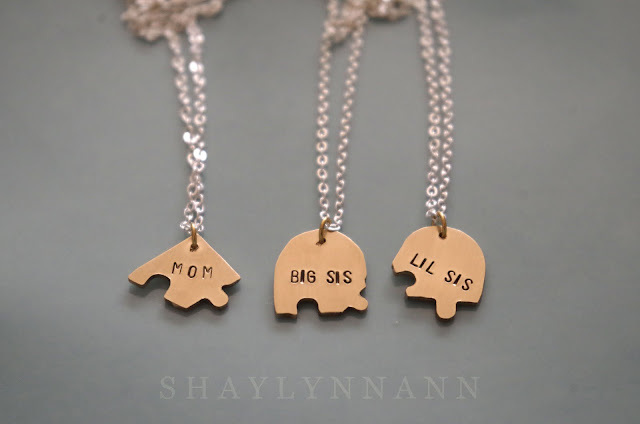 These three necklaces are another recent commission. 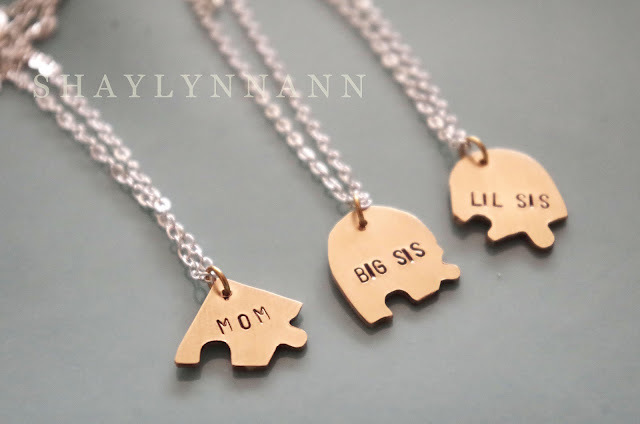 A mother wanted three coordinating necklaces for herself and her two (young adult) daughters! Like the moon initial necklaces, this was another set somewhat inspired by friendship necklaces. 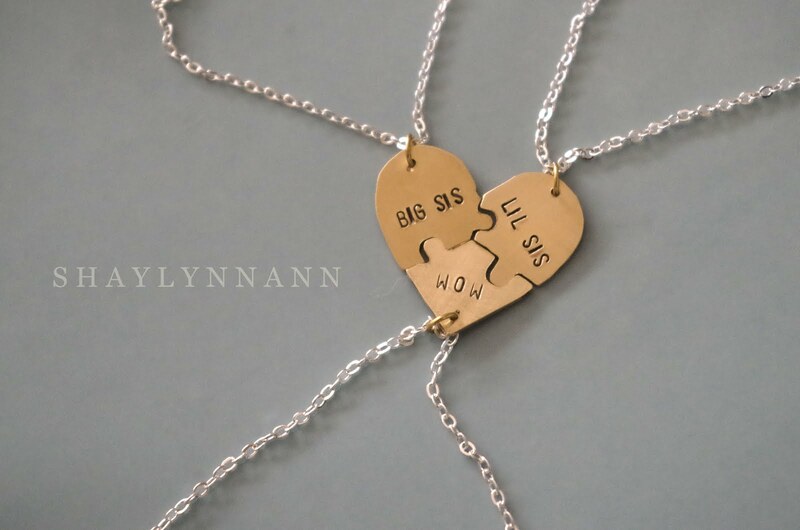 She had requested a heart shape and the words, and let me design from there. I decided to take the heart shape and break it up in to three puzzle pieces. In addition to the obvious symbolism, this meant that each individual necklace was an interesting shape on its own. These are handcrafted out of gold (to be specific, gold-clad brass-- gold clad material never wears out like gold-plating does!). Even though it wasn't solid gold, the sheet of metal was expensive and I have to admit that I was very nervous while cutting into it with my jeweler's saw. Stamping it was worse. I almost stamped the "B" upside down, but thankfully caught myself! I love having an opportunity to explore higher caliber materials than I normally work with. All three of them already had gold chains, but I sent the pendants along on basic chains anyway. Also the necklaces photograph better with chains. :) These gold is brushed, so at certain angles it is a dark rich gold, but other times it catches the light and flashes a brilliant pale yellow. 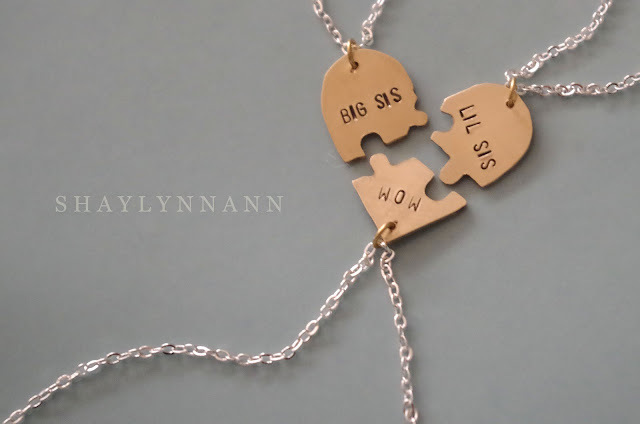 I am happy to report that these necklaces were well-received and everyone involved is the nicest ever.